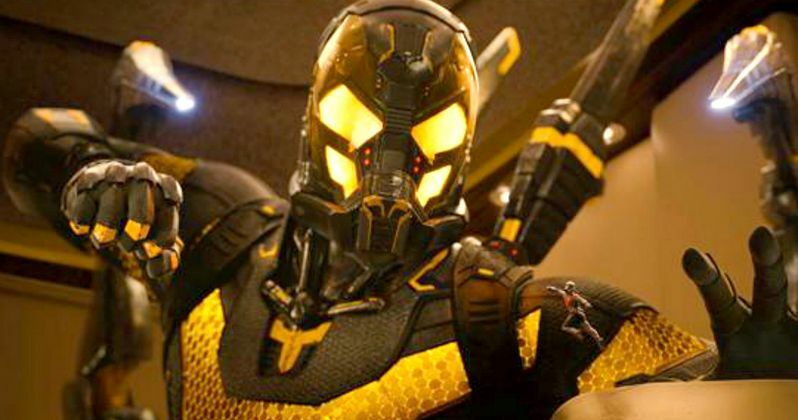 Ant-Man: First Official Look at Yellowjacket! We've gotten glimpses of Corey Stoll's Yellowjacket villain from Ant-Man in a poster that debuted in December and promo art that arrived in February, but we have never seen an official image of the costume as it will be seen in the movie, until now. Entertainment Weekly has debuted a new photo as part of their summer movie preview, which gives us our best look at Yellowjacket yet, as he prepares to throw a punch at a diminutive Ant-Man. You honestly have to squint and focus to see the tiny Marvel superhero, but trust us, he's there. As you can see in the photo below, Cross' Yellowjacket costume is armed with plasma cannons, which puts Ant-Man at quite a disadvantage, although, when Ant-Man shrinks, his strength increases, according to director Peyton Reed. "Hank Pym's Ant-Man suit doesn't have a single weapon, whereas Yellowjacket is armed with plasma cannons. Ant-Man is very fast when he's small. Also, when he shrinks, he increases his density, so he's got increased strength." Paul Rudd also talked about how playing Scott Lang was a completely new experience for him, since he had to wear a motion capture suit. "It was a new experience as far as the motion-capture-suit-ness of it. But none of it feels that different. Every part, I'm pretending to be somebody I'm not. It's all just a big lie!" Peyton Reed also shot down some recent reports that Ant-Man has already went through reshoots. The director states that there will be some additional photography, but he chalked it up to "minor stuff." "I love turning on the computer in the morning and reading the things that I did the day before-that I didn't do! We are going to do a little bit of additional photography, but we have not done any yet. It's minor stuff." Take a look at Yellowjacket below, and let us know what you think of this villain's look. Ant-Man, which co-stars Michael Douglas, Michael Pena, Evangeline Lilly, Judy Greer, David Dastmalchian, John Slattery, Neil Hamburger and Bobby Cannavale, hits theaters July 17. Do you think Ant-Man will be one of this summer's biggest hits?